Last month we looked at some troubling signs that another pellet shortage could not be ruled out again this winter. Expanding exports to Europe, mill closures due to fire, and now a forecast of another bitter cold winter are all contributing to make this winter another challenging one for pellet users. So what are the best ways to protect yourself from the threat of shortages? The easiest and most effective way is to simply avoid shopping for wood pellet fuel in the winter. Shortages typically occur during the mid to late winter – when pellet mills have already sold off their entire inventory of fuel and are limited in the amount of new pellets that can be produced. Pellet mills just don’t have a great deal of spare capacity in which to increase the volume of pellets they make in the dead of winter. So when demand for pellets begins to outstrip supply, pellets that seem readily available may disappear almost overnight leaving consumers with few options. And because demand peaks for wood pellets in the mid to late winter, this is also the period of time when shortages are most likely. With this in mind, there are a number of strategies to use to avert the risks of another shortage. By far the best strategy is to simply order your pellet fuel early – typically in the Spring. 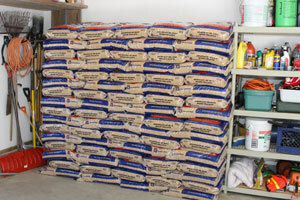 By April or May, wood pellets are usually in good supply. In addition, you will be getting the best price of the year, as well as having your fuel safely stored away before most folks are even considering ordering pellets. There is tremendous peace of mind knowing your fuel safely stored away for the upcoming winter season. One downside to ordering your fuel early is that you must have a good place to store your fuel. Many folks move the fuel inside their garage or basement during the summer. And as long as the pellets don’t come in direct contact with water – you’ll be fine. 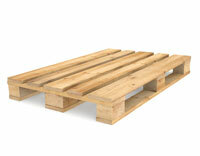 If your basement is prone to flooding, make sure to stack them on something that will keep them off the ground. But pellet fuel doesn’t have to be stored indoors all summer. Our fuel comes wrapped in such a way that you can safely store the skids outdoors for the summer as well. This gives you a tremendous amount of flexibility for storage. If you plan to do this, we recommend using an addition tarp to help provide additional protection for your fuel. But again, your fuel will not be harmed in any way by storing it outdoors all summer as long as you keep it dry! We understand that not every consumer can take delivery of their fuel in the Spring – many just don’t have any room to store the fuel all summer. For these folks, we recommend taking advantage of ‘pellet summer storage’. With summer storage, you are able to place your order well before the fall rush, and have WoodPellets.com store the fuel on your behalf. Then, you can take delivery in the fall without any concerns of shortage. Another problem that increases your risk of running into a shortage situation is under-ordering your supply for the winter. Because the winter can vary so much in terms of temperature and heating degree day – a measurement designed to reflect the demand for energy needed to heat a building – that it’s important to have enough fuel on hand to withstand the harshest of winters. A good rule of thumb is to have an extra 25% of your annual fuel usage ready as an emergency backup supply. So if you typically use three tons each winter, order four so that you have the extra ton in case you need it. If it turns out you don’t need it, no problem. As long as they are stored in a dry area, wood pellets can last many years without any degradation in heating performance. So the bottom line to avoiding problems with pellet shortages is to order early and to order enough pellets to have a safety stock that will get you through the harshest winters.